This is a well-trodden area for me. one nation upon others. I have  had to grow up again. With no right, I step into your life. to cross the border of your voice. After that, the question of permission is left for the poems to answer on their own. The opening section, ‘Reportage’ consists of short poems in narrow justified columns like newspaper extracts, all in the first person. The refugees in the poems are mostly Syrian, a few from other Middle Eastern countries, and some from the breakup of Yugoslavia. There is no information on whether these are real people and verbatim speech, but their voices are convincing, with non-native-English phrasing – “More better than we expected”, “They are not in safe”, “This is not mother can forget.” This could be criticised for ‘foreignising’, but only if the book’s project is rejected from the start: defamiliarising ordinary English expressions perhaps helps to appreciate what they mean in situations that are not ‘ordinary English’ ones, and the situations speak for themselves. The consistent and simple presentation cumulates and makes this section particularly effective. Section 2 ‘The Reach of War’ is also about individuals affected by war but told mostly in third-person, and more varied in form, although there is more cumulative simplicity in the sequence ‘Back in the States’, six soldiers with PTSD, tersely presented in W.C.Williams-style stepped threes. Two poems include the poet’s first-person presence. ‘Bosnian Girl’ is “one front page image I remember / from the Srebrenica massacre”, and the poet imagines unbuckling the belt the girl hangs by: “Feet on earth again, up she springs and runs.” The other, ‘Visit to Warsaw’, is more personally circumstantial: a skull she has found in the Jewish cemetery is that of a dog; the figurines of Jews bought in the market are caricatures, one with a violin “His bow, the length of his small hand, / like a joke-stick to throw at a dog.” There is a live sense of identification with the Warsaw Ghetto, and victimhood represented by the dog, though the dog-stick image is maybe tying the poem up too neatly. ‘Zoo’ is a story of extraordinary survival in a monkey house during World War II. Looking up this Dutch Zoo I see it was definitely used as a refuge, but I read the situation in the poem as imagined. This is one of many places where notes would help to place the poem as a literary construction, but there would need to be a lot of notes. The third section, ‘Fire Goddess’, is the complex life story of one woman, with mixed Indonesian and Dutch Jewish heritage, her suffering in the wartime Netherlands and her dying in New Zealand, with a Maori ceremonial coffin awaiting her re-creation as a fire goddess. 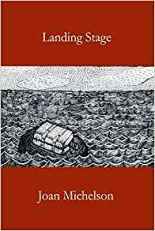 This complexity did not feel so well answered by the plainness of the verse, with exposition of where and when making the story feel less extraordinary than it is, and the Maori myth raising other questions about appropriation not covered by the careful negotiation at the opening of the book. Altogether the book does succeed in what could be thought camping out in other people’s lives, because the poems work together, not being the occasional poem about someone else’s suffering scattered among poems on a range of other subjects, but a whole book, to be taken whole on what’s there, without the burden of extensive information on sources – which works as long as you can also accept some wondering at the back of your mind about where it’s come from. The stories are ones we all need to take note of.